How quickly should my child progress? As a parent, you always want the best for your children which we understand and appreciate. We work with our children and parents to establish the children’s best learning style and ensuring they have and easy transition and positive experience with Core Aquatics. In addition, progress is often quicker as we adapt our teaching to the children’s learning style. Progression is another matter entirely…! A key point to remember is that each individual child and adult, is in fact an individual. Every swimmer will equally have their own progression path to follow. Appreciate where your child has started. For example blowing bubbles or getting a child’s face wet can be a huge achievement – particularly when they have an extreme fear of water. Always support your children with swimming and do not give up on lessons. The swimmer will have to overcome any fears or issues at some point and putting lessons off will only make matters worse. Children must feel happy and safe in the water without a parent before they will accept a teacher teaching them to swim. Our job is heavily based on trust. Sometimes trust is there within one or two lessons, other swimmers take a little more time. Always be supportive and reassuring. After the introduction stage, progress then depends on previous experience, whether there has been a negative experience elsewhere and whether they can already swim. Some swimmers are more gradual learners, whereas others can pick things up quite quickly. Both are normal and we adapt our lessons for all! Please read our previous blog which explains how lesson types (group, one to one, and two to one) can impact progression. 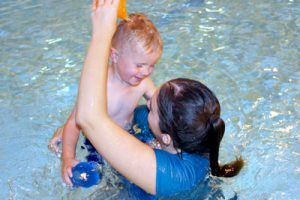 Swimming engagement is a key element of progression – if lessons are in children’s language then the more enjoyable lessons are. Our teachers adapt their language to the different swimmer ages and find storytelling, competitions, games and praise work. Toys and equipment can be manipulated for pretend play (noodles to motorbikes, steering wheels, horses). Developing a rapport with the children is important that is fun but also ensuring a degree of discipline is kept. Spending a few minutes at bath time practicing or going swimming with your children can improve swimming significantly. We are happy to guide parents with ways to improve the children’s swimming and what is classed as correct technique. Progress is regularly communicated with our parents especially how to help encourage muscle memory (how the body automatically know how to do something). Core Aquatics always encourage parents to listen/watch how we teach and eco in practice. There are specific ways of terming instructions to get the correct outcome, for example, some parent’s say ‘ use your legs to make the biggest splash you can’. Children then kick their legs out of the water, bend their knee and give teachers a shower in the process! Small, fast kicks are more efficient, comparing to soldiers, ballerinas and tree trunks go down very well. Regular weekly attendance makes a huge difference in swimmer progression as practice is maintained. Do let us know everything that makes your children happy, television programmes, favourite holidays etc. We use these all the time in lessons to help children understand how to swim and make lessons enjoyable (important for progress). Finally, it is important not to pressure your children, even the best swimming teachers in the industry cannot turn swimmers into Olympic swimmers overnight. Swimming is about learning skills and technique safely, not just swimming lengths up and down. If you would like support as a swimmer, or even for your children we can help. Contact Nicole at Core Aquatics today for the latest information on classes. Co written by Nicole Martin and Sophie Hicks, Core Aquatics Swimming Teachers.